Alright, clear your schedule for the weekend and let’s get decluttering! No one wants to face the real disorder of their home so we’ll keep it sweet and simple. Here are a couple of tips to keep the mess under control that we’ve learned while tidying our homes over the years. Decluttering your home will help you organize your life and even your thoughts while also making it easier to keep your home organized in the long run. 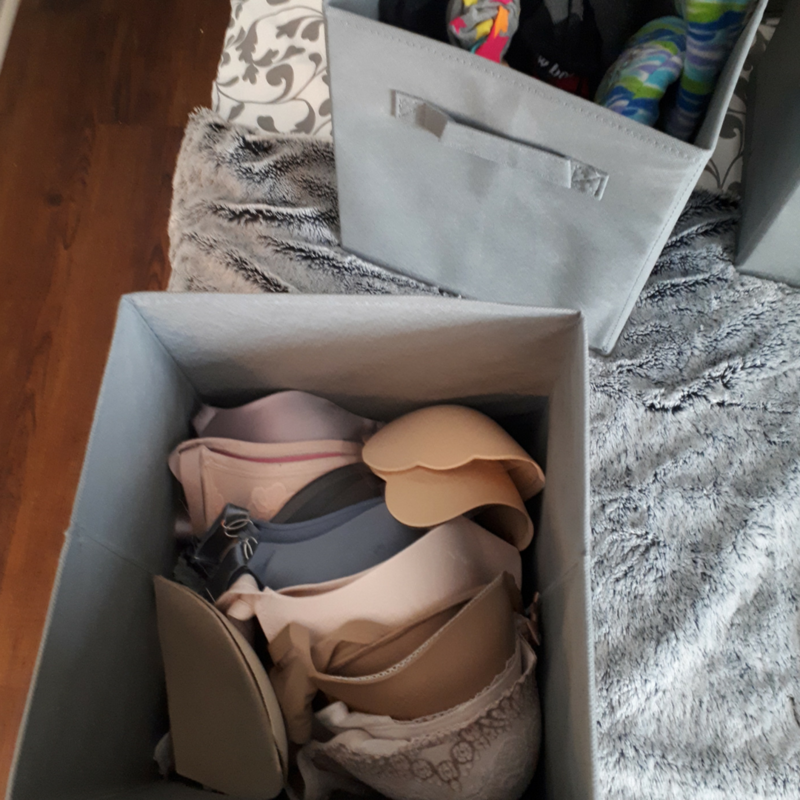 To get started, try and keep all of your similar items together. Doing this will keep your home less cluttered and make it easier for you to find things. I found that I had tons of random items laying around my place with no real “home.” This just made the space seem smaller. So, I made designated spots for items that were more than one of the same. Examples of these things are accessories, socks, purses, bras, cables & tech cords and books. If you are a visual person, labels can be extremely useful. They will help you stay organized while you declutter. Let’s face it, when you’re reorganizing and move things around, you WILL forget where you moved your items. Also, if you live with others it’s helpful to mark which items are yours. You can find labels anywhere. You can find them at your local Wal-Mart, print/make your own, or get fancy ones from Michael’s. Learn how to make your own labels here. 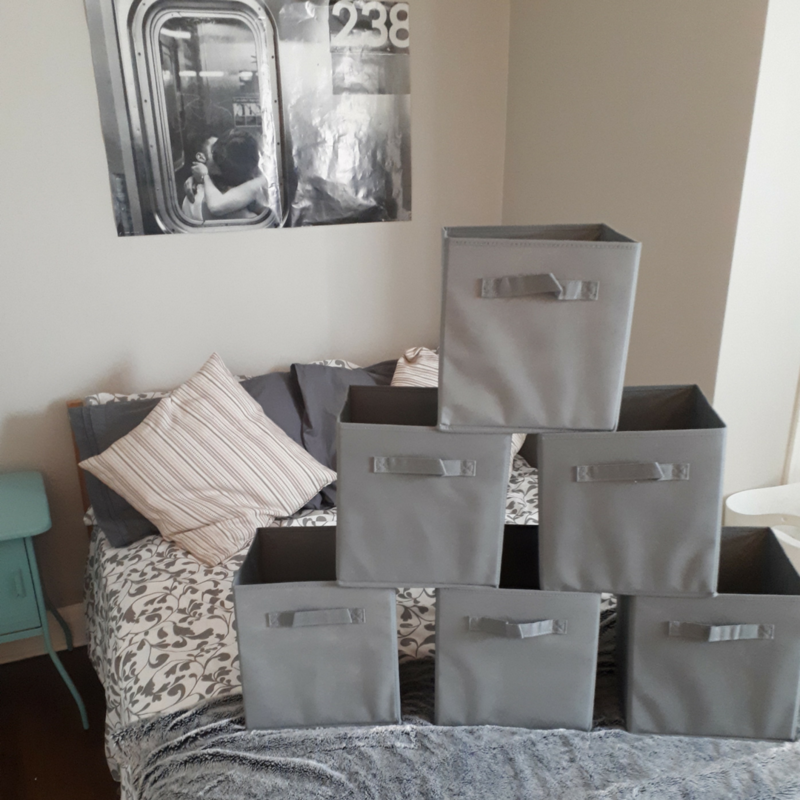 Anything you have that resembles a box, jar or bin makes a perfect storage unit.You can reuse and decorate these items at any point. Get creative with mason jars which are perfect for organizing makeup, storing your hair ties or for making small crafts and gifts. Shoe boxes are one thing I have a lot of! Shoe boxes are great for storage because you can rewrap or decorate theme to store just about anything. I use mine to store my summer bathing suits and flip-flops. Yes, magazine holders can have multiple uses. You can use them to hold your magazines …BORING! 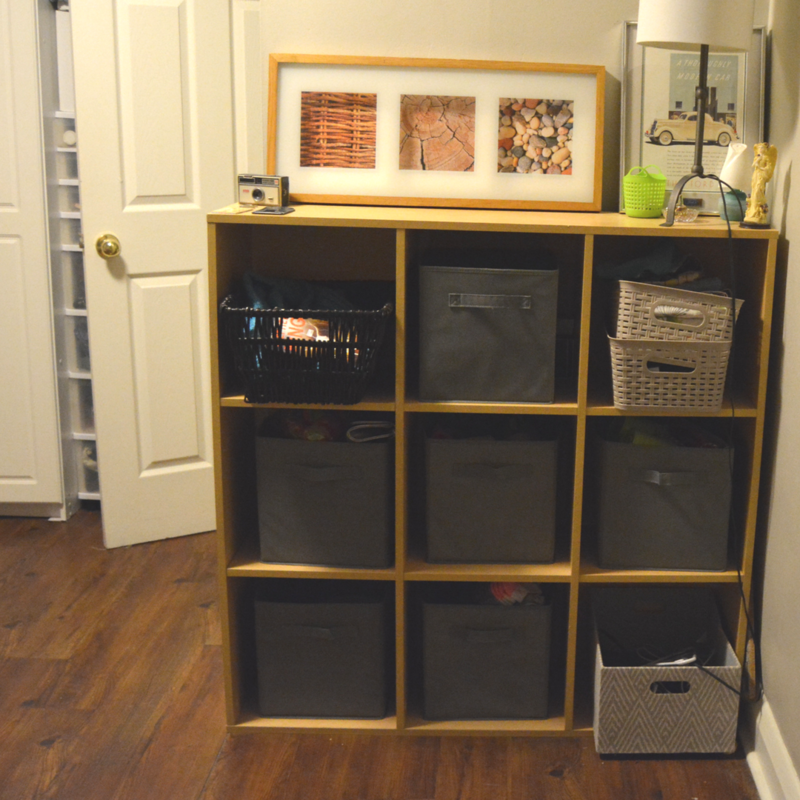 Or you can use them in other creative ways to organize your home. 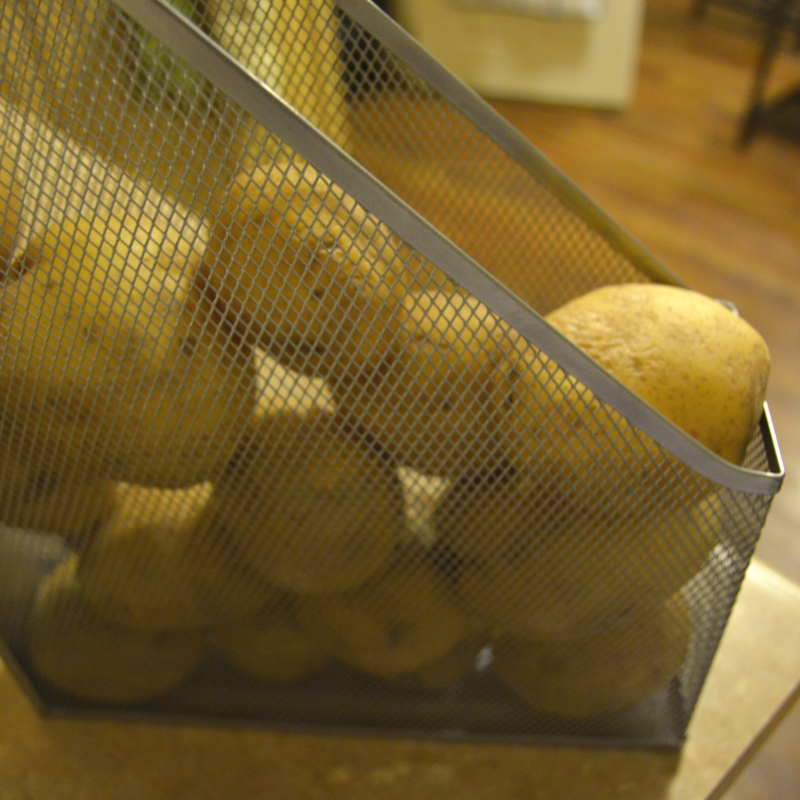 You can use them as holders for potatoes and onions in your pantry or cupboard, or you can use them to store plastic wrap and foil for cooking under your sink. 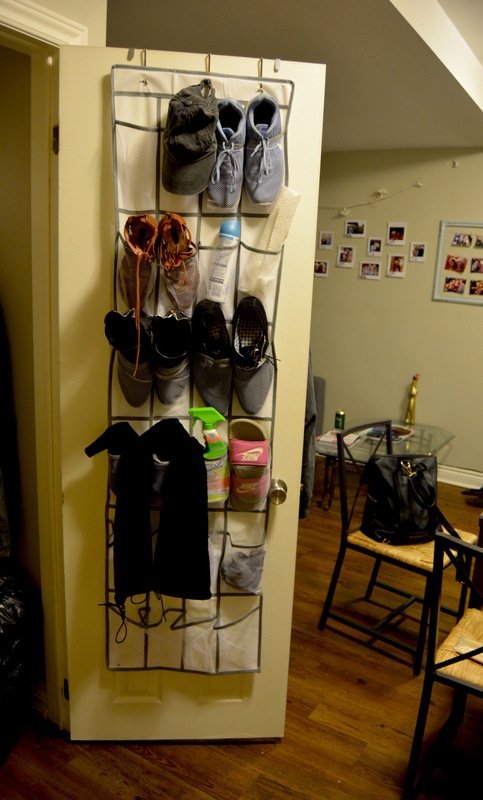 The hanging shoe organizer is one of the best organizational purchases I’ve made recently. It’s perfect to hang up in a storage closet and store all your shoes (by season) or to store other items like cleaning materials, hats, umbrellas, mitts, gloves, and scarves. Since it hangs on the back of the door, you don’t even have to think about it and it keeps everything organized and conveniently easy to grab. The most important step in decluttering is…LET GO! Anything you haven’t used in over a year and don’t plan to use in a year should go. I took this as an opportunity to sell some of my older items as well as give my good quality items to friends and family. Anything else can go to thrift stores. 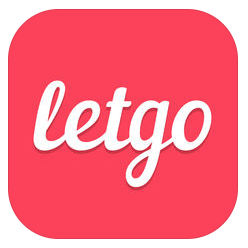 If you are looking to sell any of your used items online before giving up on them, Let Go is the perfect app. 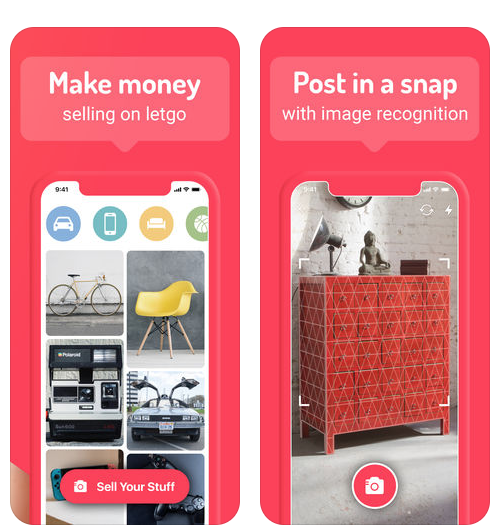 It lets you quickly snap pictures of items you want to sell at your set price, a negotiated price or free. 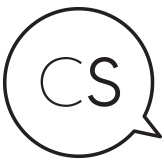 It is a quick and easy way to post things online you want to sell while you declutter! I posted a couple of my old phone cases and purses and had offers within hours. Not a lot of storage space? Cube shelves. If you are living in a smaller space and keeping it tidy is hard enough as it is, try cube shelves. Cube shelves are a great way to make use of your limited space and are ideal for storage. 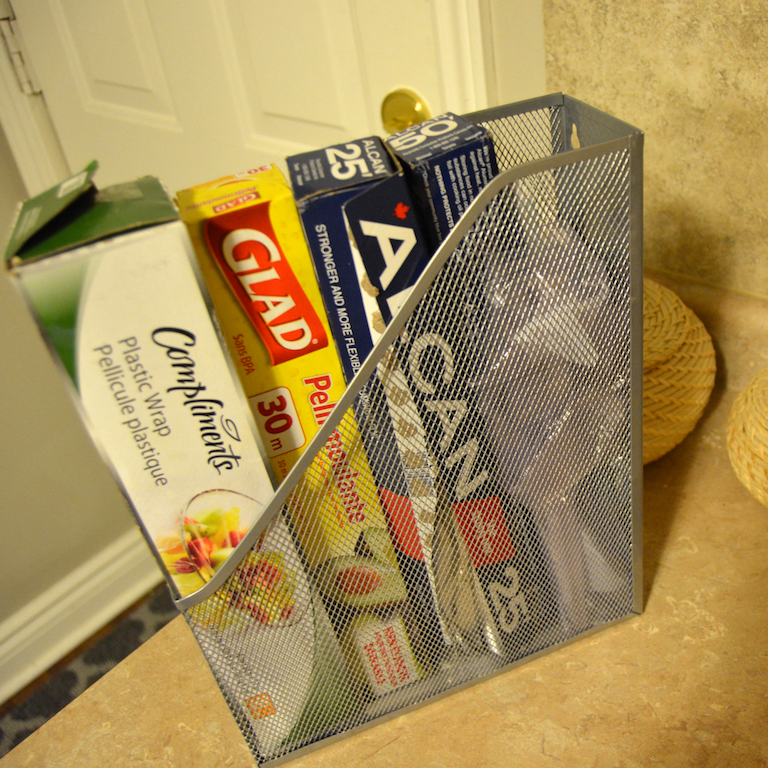 They work perfectly with this set of 6 foldable fabric baskets from Amazon. Similar Ikea cube shelf here. Over the years I have tried various jewelry organizers and to be honest with you I always find a way to tangle, break or lose my jewelry. Here is what I did to fix it. I organized all of my jewelry in categories: necklaces, rings, and earrings. An easy way to organize your necklaces is with push pins. 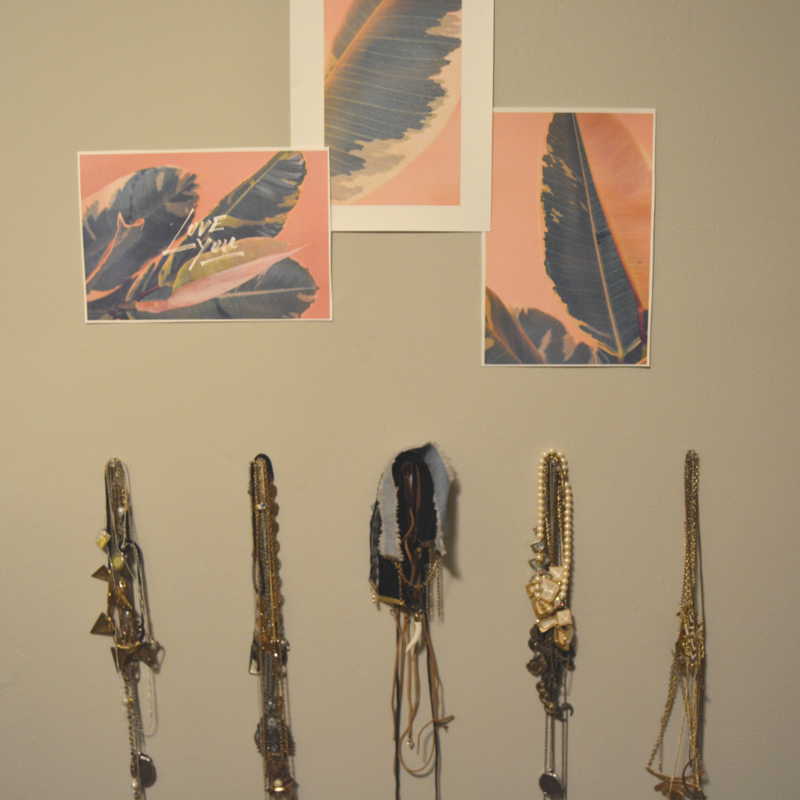 You can hang quite a few necklaces on a push pin on the wall so that they are easy to access and see as well as do not get tangled as easily. It even looks fun on your wall! Organizing earrings can be a little more difficult. You may use a pencil holder with holes in it from the dollar store or your desk at home. 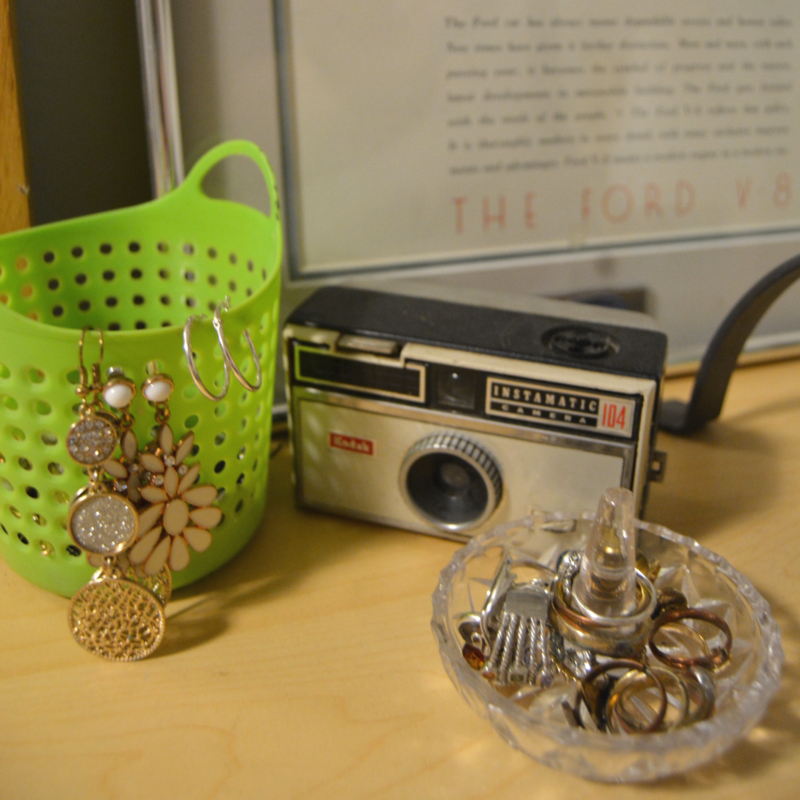 You can use these holes to organize any dangly earrings and place the rest inside of the pencil holder. For rings, I recommend a ring holder or a small dish which you can place them in or on. Having a designated spot for each of these different accessories is a great way to keep the clutter down in your bedroom and stop you from losing all the accessories you love.